From Hong Kong to Buenos Aires, professionals in health care and mental health are being trained in a time-tested approach for engaging patients and facilitating behavior change. While highly effective, this approach referred to as motivational interviewing or MI, is deceptively simple, yet requires a complex skill set. While often described as a new trend or technique by those outside of the field of health or medical psychology, it has been the focus of 300+ rigorous research trials since first described over 25 years ago. MI differs in significant ways from other approaches. Unlike patient education and advice-centered approaches, it is both patient-centered and effective. In contrast to popular life coaching approaches (that often touch on MI techniques or terms), it is well-suited patients of nonwestern descent and is most effective with the patients who are least motivated to change. Further it has proven effective in brief encounters and works in a little as one session. It is the ideal complement to evidence based medical treatments which patients often don’t adhere to or self-care or lifestyle regimes where follow-through is traditionally poor. Finally, like many interventions that have been verified in rigorous randomized, controlled trials, it has been applied widely across the care continuum with many patient populations by many types of practitioners. At a time when roughly 85% of avoidable health care costs are due to behaviors, it may be one of our most promising tools. Today most health care practitioners in population health (wellness, disease management and case management) have had some exposure to MI—either through an article in a professional journal, book, DVD or a training workshop. While there is no other approach to health behavior change that approaches the efficacy of MI, we do know that MI requires a complex skill-set. Another major barrier to adoption is that it requires a major shift in the provider role. In MI the righting reflex which is virtually instinctive to health care providers must be suppressed as it is at odds with the very foundation of MI—patient centeredness. 3. Assessment of an audio sample of the Learner’s Health Coaching work with feedback and coaching provided by an expert in MI (MI experts advise again assessing role plays). 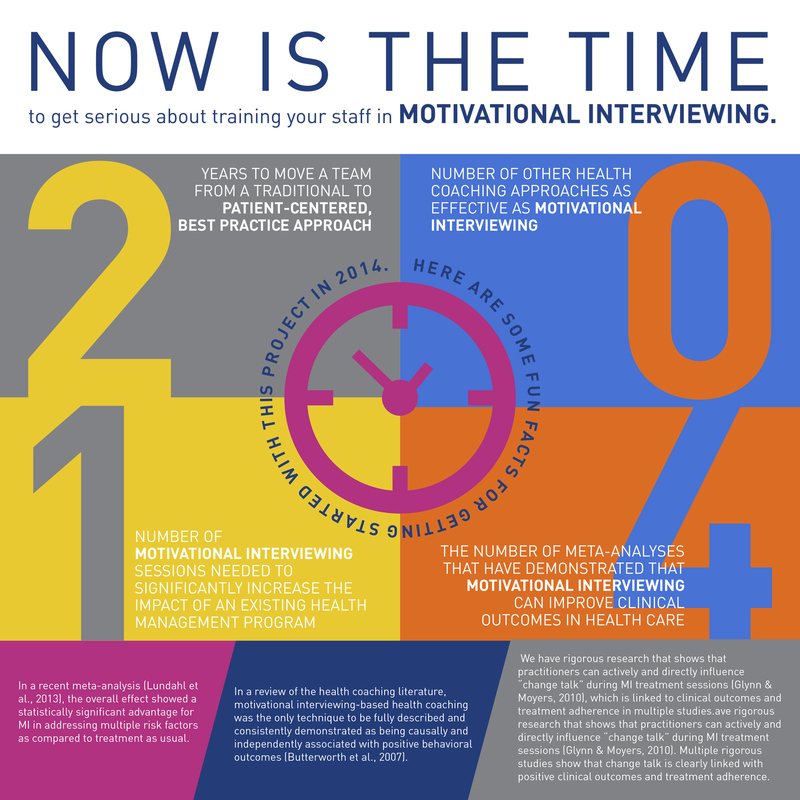 At a time when chronic conditions account for 75% of health care costs and patients with chronic conditions are the most frequent consumers in health care settings from primary care to hospitals, it is essential that population health specialists, as well as direct care providers update their skill-set to include motivational interviewing. Not only will this support better patient-level outcomes at a time with chronic conditions are the main threats to public health, it will make the job of health care provider more rewarding and enjoyable.